Learn the ancient technique of goldwork embroidery with artist Hanny Newton in this completely free, walk-in workshop. Goldwork graces the Queen’s finest gowns and ecclesiastical garments, which make use of the way metal captures the light to dazzle the public. You will here learn how to hand-stitch at home, using goldwork to add another dimension to your embroidery in our all-ages, beginner-friendly workshop. 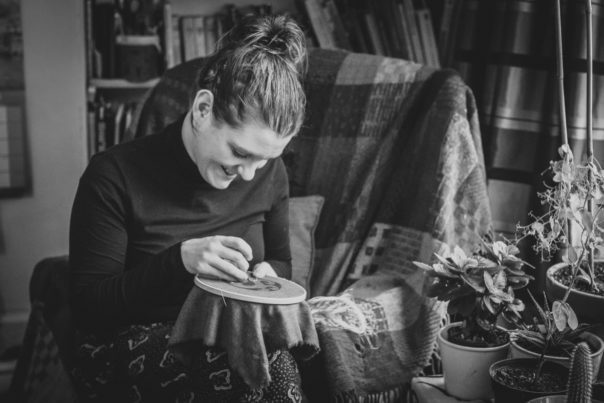 Hanny is a hand embroiderer with a great love or stitch, and a belief that embroidery should be about following your passion not just following the rules. She loves sharing her passion for stitch with people from all walks of life and has recently taught goldwork at the British Museum.